Glaucoma is a group of diseases that can damage the eye’s optic nerve and result in vision loss and blindness. The most common form is primary open-angle glaucoma, which is one of the main causes of blindness in the United States. With glaucoma, the fluid within the eye drains too slowly, and, as the fluid builds up, the pressure inside the eye rises to a level that may damage the optic nerve. When the optic nerve is damaged, peripheral (or side) vision is affected, narrowing the field of vision. Left untreated, total vision loss can occur. In the early stages of primary open-angle glaucoma, there are no symptoms. However, only 8 percent of people in the United States are aware of this fact. It’s important for people to know that glaucoma can be detected early before noticeable vision loss occurs, and that vision that is lost cannot be restored. Although glaucoma cannot be cured, it can usually be controlled. Vision loss can be prevented or minimized with early detection, treatment, and appropriate follow-up. Almost 3 million people ages 40 and older have glaucoma, yet only half know they have it. Even more alarming is that the number of people with glaucoma is projected to increase in the next few decades to more than 4 million by 2030 and more than 6 million by 2050. African Americans over 40—It is still unknown why this specific population develops glaucoma earlier than others and is more likely to experience vision loss from it, so it is very important to reach them early. Everyone over 60, especially Hispanics/Latinos. 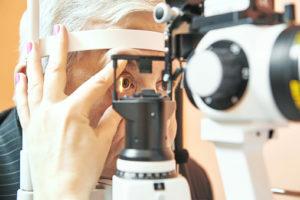 For more information go to www.glaucoma.org.